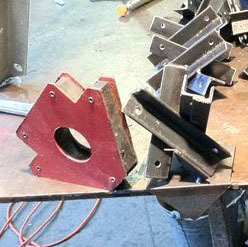 There is a special tool to help hold the metal in place when making WikiSeat Catalysts. Actually there are two. This Jig works great for making your first Catalyst. Jig 1 Instructions are freely available over at Instructables. Jig 2 lets you make catalysts much faster, but you will need to use a Catalyst to make it. Jig 2 Instructions are freely available, or you may purchase one from our store.